The AFL have this evening confirmed the teams that will compete in the two Men's divisions for the rest of the International Cup. The fixture for the next week in Sydney follows. But we will highlight that the match between the USA and South Africa will be the curtain raiser at ANZ Stadium before the Sydney Swans vs St Kilda match. With the first day's Lightning Premiership done and dusted, we've had a glimpse of powerful displays from Ireland, NZ, PNG and South Africa. It seems that one or two scores originally entered into SportingPulse were incorrect, but with the corrections, the further seeding now consists of: New Zealand (1), Ireland(2), PNG (3), South Africa (4), USA (5), Nauru (6), Denmark (7), Canada (8), Great Britain (9), Sweden (10), Tonga (11) and Japan (12). Pools 1 and 4 give all nations a good mix of opponents beyond the usual suspects, Pool 2 though sees Denmark, Ireland and Sweden clash, who may be disappointed to be facing off when they have a chance to do this almost every year regardless of the IC. Pool 3 sees three Pacific island nations going head-to-head, but as there hasn't been a great deal of tournament play in that region, it might not be as big an issue as with the Euro nations. Division 2 will presumably be Fiji (13), France (14), China (15), India (16), Peace Team (17) and Timor-Leste (18). Most games went according to script, with some major blowouts between the established nations and the minnows. In the pool that was seen as hardest to tip, Japan have won through into Division 1, with a hard-fought 2-point victory over Fiji. The Fijians were strong and athletic, but the Japanese were able to overcome them through better structural play around the ground. The Fijians can take consolation in being the only Div 2 side to get through the seeding matches without any major thrashings, and look to be favourites to take out the Division 2 title. The Peace Team and Timor-Leste both failed to trouble the scoreboard, but as the Peace Team were seeded higher pre-tournament will be ranked 17 when calculating the remainder of the draw. The official confirmed draw for the remainder of the tournament will be released by the AFL by 10pm AEST tonight. WFN's match reports from the day's proceedings will be on the site within the next day. All the results from the AFL International Cup Game Day 1 at Blacktown International Sportspark Sydney will be added throughout Saturday 13th August - we're aiming to have scores up for every game at each half (these are 2 x 15 minute half games). We suggest you refresh your browser regularly to see the latest. Match reports will follow later in the day and into Sunday. Friday morning saw the Captains media launch and Friday night saw the Official Welcome for the 4th AFL International Cup. Nearly 1000 players and officials gathered in the Crystal Palace at Luna Park beside Sydney's famous Harbour Bridge. Shanell Dargun (also playing for the Australian women's side) started proceedings with the Australian national anthem. A traditional indigenous Australian welcome was followed by speeches from AFL General Manager of National and International Game Development David Matthews, AFL Commissioner Sam Mostyn, IC11 Ambassador Brett Kirk and South Africa's Mtutu Hlomela. As is becoming an International Cup tradition, there were impromptu cultural performances by South Africa, Tonga, Peace Team. The night also included a recorded message from Australian Prime Minister Julia Gillard, a well known Western Bulldogs supporter. Some photos follow and we'll be uploading more to our launch day media gallery. Sydney turned on showers for the IC11 launch at Luna Park this morning. Captains, team managers, AFL officials special guests and the media arrived at Luna Park this morning to witness the launch which was moved inside. AFL General Manager National & International Development David Matthews opened proceedings thanking the traditional owners of the land welcoming everyone and thanking Tony Woods and the development team in their organisation of IC11 event. One of the teams present at this month's International Cup won't represent a country; making their return will be the (Peres) Peace Team. 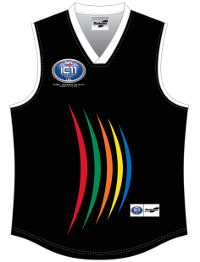 The team attracted attention both positive and sceptical in 2008, but with the AFL's approval of the team, the result with Israelis and Palestinians of Islamic, Jewish and Christian faiths pulling on a "Peace Team" jumper and representing unity in a region troubled with violence was seen as a positive one. Including internationally recognised documentaries on the experience; and the flow on from the 2008 team still continues to resonate throughout corporate, communal, educational and political leaders throughout Australia and in parts of the world. 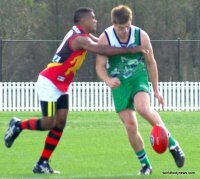 The 2011 AFL International Cup commences Saturday morning (August 13th) with the 18 men's teams playing off in 2x15 minute halves in their 6 pools, each side playing 2 matches. The top 2 sides from each group go through to Division 1 (12 teams), the bottom side Division 2 (6 teams). Since the pools are seeded it's expected that the top seed in each pool will easily account for the bottom side - even with reduced game time expect to see some 100+ victories, e.g. PNG over France, NZ over India, Ireland over East Timor, Canada over Peace Team. A couple of results that might go a little closer could be SA over China (but still expect a blow out) and Nauru versus Fiji - the Chiefs should defeat the new boys pretty comfortably but it'll be a good guide as to what to expect from Fiji. There'll be much more interest in the matches between the 1st and 2nd teams in each pool, and when 2nd and 3rd play each other. IC11 Preview - IC11 Squad - Which way will the Northwind blow? 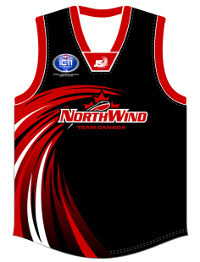 Canada's Northwind are ranked 6th for IC11 and could be expected to rise given their previous Cup finishes of 9th (2002), 7th (2005) and 6th (2008). No doubt the coaching staff will be hoping they can crack open the top 4 and gain a semi-final birth, but the top nations won't give up their spots easily. One of the world's largest countries by area, Canada in some ways shares a lot in common with Australia. Both are wide open lands but with much of them not particularly hospitable and relatively small populations, which are mostly of European descent as well as a significant indigenous population. Both have strong friendship with the USA and are heavily influenced by it, but also have a healthy scepticism towards that country in some respects and enjoy their differences. It's now just a few days before the opening function for the fourth AFL International Cup and some of the teams have begun arriving. South Africa lead the way, touching down in Perth the Friday before last, whilst Sweden had their jumper presentation event in Melbourne last Monday. The first official duties will be the Captains Launch in Sydney on Friday morning, followed by a Welcome Function at Luna Park beside Sydney's famous Harbour Bridge. 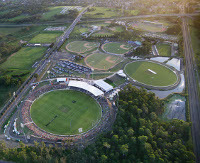 The next morning is Game Day 1 at Blacktown International Sportspark Sydney (BISS). The men's competition kicks off with all sides grouped into 6 pools of 3 teams (based on the AFL's seedings, mostly from IC08 finishing positions). They play a match against each of the other 2 teams in their pool. The games are shortened, 2 halves of 15 minutes, and at the conclusion the bottom side from each pool will form Division Two and the top two teams from each pool will form Division One. Each Division will be seeded based on the results of this opening day and Division One re-grouped into 4 groups of 3, which will play off amongst themselves (2 matches over 3 game days). Division Two, with 6 teams, has a similar but slightly different pattern. Meanwhile the Women's Division will get underway Monday 15th August (the second day of men's matches) and have a launch function that evening at BISS. It's a busy day with representatives from each nation starting the day with Morning Tea at the Prime Minister's Sydney residence, Kirribilli House. But on to the important part - who wins? For a bit of fun the worldfootynews.com crew have come up with their predictions for the final ladder positions for both the men's and women's, and combined the results of all the writers to come up with a consolidated prediction of where the nations will finish. Read on to see who we predict to win the 2011 International Cup. The Australian Multicultural / Indigenous team is made up of players from Indigenous and Multicultural backgrounds from all states and territories in Australia. The players have varying experience in football, from VWFL regulars, to the girls from Galiwin’ku in Northern Territory who play on sand ovals without football boots! Though most of the girls play in senior women’s teams in leagues across Australia, state representatives who were selected for the Women’s National Championships were not allowed to try out for the AMI team. Nova Peris does not have experience coaching Australian Football but is a famous Indigenous Olympic athlete who has represented Australia at both field hockey and athletics. She won a gold medal with the women’s hockey team at the 1996 Summer Olympics, then in 1997 she switched to athletics and became a double gold medallist at the 1998 Commonwealth games, winning the 200m sprint and as part of the winning Australian 4x100m relay team. She has also represented Australia in athletics at the 199 World Athletics Championships and at the 2000 Sydney Olympics. 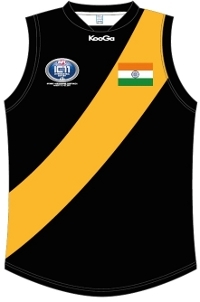 The Indian Tigers return to Australia this month for their second International Cup campaign. The team's participation in 2008 was supposed to be the launching-pad for football in India. This wasn't to eventuate, with the administration giving the game away upon their return to India. Fortunately two of the players, Sudip Chakraborty and Darren Ross stepped up and took charge of the organisation, assisted at the Australian-end by our own Ash Nugent. The team's participation in 2011 is the product of these two players' passion for football. IC11 action starts this Saturday 13th August at Blacktown International Sportspark Sydney. The best place to find out the weather in Australia is the Bureau of Meteorology and in particular for the Blacktown area the closest forecast will be that for Paramatta. At time of writing the prediction for this Saturday is "7C overnight and 18C maximum during the day, a shower or two. Partly cloudy. Isolated showers. Light winds". Read on for some basic transport information.